American Plastic Toys offers a new design to the classic picnic table with this all-in-one-piece square-shaped table and benches, super stable with room for four children. The four-sided design is super easy to assemble and does not require tools or screws (32.5" x 32.5" x 17.5”). Made in America. Jumping fun for everyone! Made from soft, durable foam and great for indoor and outdoor play This lovable foam pogo jumper squeaks with every hop! 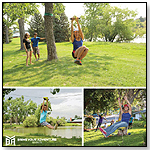 The bungee stretches to accommodate children of all heights and can support up to 250 pounds. Kids and adults alike will have a hopping good time on the Hop & Squeak Pogo Jumper. (From ages 3 to 100 depending on the functionality of your bones at that age. Unique modern styling and adapts to multiple terrains! Made in USA of US and imported parts. Accessories made in China. Stylish and fun design eases the transition from strollers. Adult steers with push handle. Full turn front wheels provide better maneuverability. Handle folds under for easy storage and transport. "Whisper Wheels" provide a smooth, quite ride. Caster wheel engages for easy swivel turning and retracts for riding on rough terrain. Pretend steering wheel with "beep beep" horn sounds. Large capacity under-hood storage is perfect for snacks or supplies. Cup holders for child and parent. Adult assembly required. — Steven Levy, owner of Toy City in Keene, N.H., told TDmonthly in a March 2015 survey that the Sportster from Step 2 is his store's best-selling ride on toy. Bella Butterfly swings open on the easy-access door of this whimsical bug house. A sturdy handle, a beautifully striped floor and lots of air holes provide the perfect place to house and observe insects and bugs. Dimensions: 5.5" x 7.5" x 3.5"
— Mary Porter Green, owner of Curiosity Zone in Ashburn, Va., told TDmonthly in an March 2015 survey that bug houses are one of her store's best-selling outdoor toys. Outfit your bike or scooter in style! The Bike Airplanes propeller spins as you ride! Made of plastic. Measures 7.62" x 5.5" x 1". — Ari Miller from Off the Wagon in Kent, Ohio, told TDmonthly in an March 2015 survey that bike accessories like the Bike Airplane are one of their store's best-selling outdoor toys. Board game strategy meets target game skill! The magnetic game pieces can be used for scoring, attacking, blocking, and more! And with our fold and go design, you can take the game anywhere, indoors or out. The 'aeros' are packed with three high powered magnets and when you launch them with a pair of KOOBA sticks, these things can really fly! It’s as easy as 1-2-3! The Presto tent comes ready to set up. To assemble, remove the tent from the carry bag, pull the string upward, and PRESTO, your tent is together right before your eyes. It is perfect for setting up at the beach, your backyard, or even at the park. Due to the engineering of this ultra-high quality cabana, it has the structural stability to withstand wind and provide protection from the harmful UV rays. To take it down, just touch the center. What better way to relax then having a tent so easy to set-up! Every princess needs their own castle! This one has a waterproof floor, mesh windows, and is large enough for more than one child to play inside. It packs into a small carrybag and can be used outdoors or in. Twice the length, twice the fun! These giant water slides range up to 30 feet long and are up to twice as wide as other slides on the market. Made with twice the strength and durability, Slide & Surf is built to last for endless water fun. Riders can slide or skimboard on Slide & Surf's slick sliding surface! New padded start, misting side walls and splash pool will make the summer fun memorable for years to come. Other products from KETTLER INTERNATIONAL INC. Your child can pedal forward or backward on this tricycle, or you can push them using the bar. There is a safety belt on the tricycle seat, and a bucket that snaps on to the back of the tricycle - or, can be attached to the pushbar to create a new toy! Unleash your inner warrior and soak your targets with the bow-blasting soakage of the Dolphina Bow Blaster! It's easy to load this stylish soaker with up to 25 ounces of water, then you just pull the handle back and push it forward to fire a blast of water at your target. Show off your skill and soak your mark with the Dolphina Bow blaster! Frogglez® Goggles are swim goggles made out of neoprene (wet suit material) with a patented strap design. This design fits 90% of children between the ages of 3 and 12 very comfortably. An easy to use velcro adjustable connection allows for size adjustments. They do not pull hair or fold down ears. Geocaching is a GPS based treasure hunt. Containers of various sizes are hidden and the co-ordinates are recorded and logged on www.geocaching.com. These co-ordinates are loaded into handheld GPS devices. Then the GPS device directs you close to the location hidden geocache, then you must look for the hidden geocache. 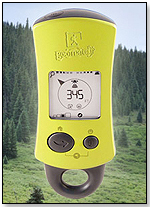 The Geomate.jr comes preloaded with 250,000 geocaches covering all 50 states (or your country.) Just switch on the Geomate.jr, then follow the distance and arrow to the closest Geocache. See, we told you it was easy! The Geomate.jr will display the 20 closest geocaches to your location. The Geomate.jr also gives you information about the geocache such as cache ID, difficulty, terrain and size. Worried about getting lost? Don’t! You can set and save your home waypoint with the Geomate.jr so you can always find your way home. The Geomate.jr also saves your found caches, so you can review your found list at any time. Using our Brand New Patented BUNGEE Power system, the AIR ARCHER(tm) can propel safe, soft foam rockets up to 150 ft! 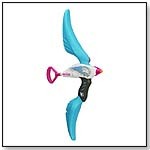 The AIR ARCHER(tm) is another revolutionary item added to the award winning PUMP ROCKET(r) line! Aerodynamically designed to optimize speed, distance and height, the Sky Shredder is the ultimate in performance flying discs. Throw further, faster and with precision using the latest technology from BYA Sports. The lightweight material is ultra-soft and dynamic, but remains stable in flight with strategically placed ventilation ports. Use on its own or add a standard tennis ball in the center to propel your game to the next level. Recommended for ages 8 & up, 1 disc $7.99 MSRP or 3-pack $11.99 MSRP. Create an adventure vacation experience at home with the Sky Line backyard zipline kit from BYA Sports. Made from high-quality steel, this industrial strength kit is available in multiple lengths and with or without seat to customize your ride. Recommended for ages 8 & up, starting at $99.99 MSRP. This is our Largest Big Bubble Zone wand, the Mega Wand. Each package includes 1 (one) wand plus a FREE 16oz. ready to use bottle of Super Miracle Bubbles. Create an adventure vacation experience at home with this backyard zipline kit. Made from high-quality steel, this industrial strength kit from BYA Sports is available in multiple lengths and with or without seat to customize your ride. Recommended for ages 8 & up, starting at $99.99 MSRP. 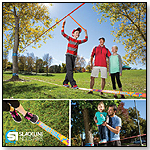 Turn any environment into a playground with this easy-to-use slackline kit designed for beginners. A guide line and arm position trainer are included to mount overhead making it simple to learn and fun for the whole family. Recommended for ages 5 & up, 2 inches wide, 50 feet long, $79.99 MSRP. Your little one will dance and twirl right into our "Ballerina" Soft Cotton Canvas Castle. This is the paramount ballerina experience. Big enough for the whole neighborhood, kids can play with all of their toys and stuffed animals and still have plenty of room left to pirouette in! Its unique, circular design is supported with a metal sub-structure, and provides an extra-large play area. The diameter measures 55” and is 63” high; perfect for indoor use and fun for the entire family! This distinctive play tent is easy to assemble and easy to clean. It gives an imaginative, stimulating experience! No batteries or video screens; just hours of imaginative play-time fun! This "Firehouse" House Tent is big enough for the whole Fire Department! The exterior has a bright red brick graphic with all the accessories a firehouse would need to put out a fire! This tent is so durable it can be used indoors or outdoors. This house tent is always an excellent way to have fun while developing cooperative skills. This tent comes with mesh panels at the top for ventilation on hot days, as well as easy viewing for parents. One tunnel port comes with roll up flaps that secure with Velcro tabs. This house tent comes with two roll-up windows and two extra-large roll-up fire doors to drive your fire truck in. This also creates a nice tunnel-like experience and pass through. Color-coded poles make for easy assembly. A must have for every little firefighter! From: STRIDER SPORTS INTERNATIONAL INC.
Other products from STRIDER SPORTS INTERNATIONAL INC.
STRIDER™ balance bikes are industry-leading training bikes that help children as young as 18 months learn to ride on two wheels. STRIDER balance bikes focus on the fundamentals of balancing, leaning, and steering without the distractions and complications of pedals or training wheels.The STRIDER’s simple, no-pedal design builds confidence and eliminates fear by allowing kids to have their feet on the ground and progress at their own pace. This unique design teaches young children balance on two wheels right from the start. Parents love it for its light weight, adjustability and ease of assembly. Age grade: 18 months – 5 years.